In a historic first for South America, the Olympic Games opened in the Brazilian city of Rio de Janeiro on Friday. Brazil’s acting president Michel Temer declared open the games at a colourful ceremony at the iconic Maracana Stadium, before retired marathon runner Vanderlei Cordeiro de Lima lit the Olympic cauldron. A low-tech but dazzling opening ceremony showcased the culture of Brazil’s favelas (slums), its carnival traditions, its sensual bossa nova music and the skylines of modern Brazil. Producers carried the audience through history of the Portuguese invaders’ subjugation of indigenous tribes, the use of African slave labour to build the country to contemporary Brazil’s majestic cities. Chinese Vice Premier Liu Yandong, the special envoy of President Xi Jinping, attended the opening ceremony along with many international dignitaries including UN Secretary-General Ban Ki-moon. Over 11,000 athletes from 207 delegations have gathered in the country for the Games. Rio’s Olympics are costing nearly $12 billion with big legacy projects like a new metro line, bus highways and massive real estate developments. More than half of that has come from the private sector. International Olympic Committee (IOC) Thomas Bach said the city of Rio de Janeiro will benefit from the Games. He thanked Brazil for hosting the games amid political turbulence. “This is the moment of the cidade maravilhosa. These first-ever Olympic Games in South America will go from Brazil to the entire world… With the Olympic Games as a catalyst you have achieved in just seven years what generations before you could only dream of. You have transformed the wonderful city of Rio de Janeiro into a modern metropolis and made it even more beautiful,” he said. “Our admiration for you is even greater because you managed this at a very difficult time in Brazilian history. We have always believed in you,” Bach, a fencing champion at the 1976 Olympic Games, added. Brazil currently has two presidents — Dilma Rousseff is suspended as she awaits an impeachment trial. The two Brazilian leaders responsible for bringing the Olympics to Rio, Rousseff and her predecessor Luiz Inacio Lula da Silva, did not attend the opening ceremony. Labor unions and student groups are planning protests against interim President Temer across Rio’s beach-front avenue in Copacabana over the next few days. 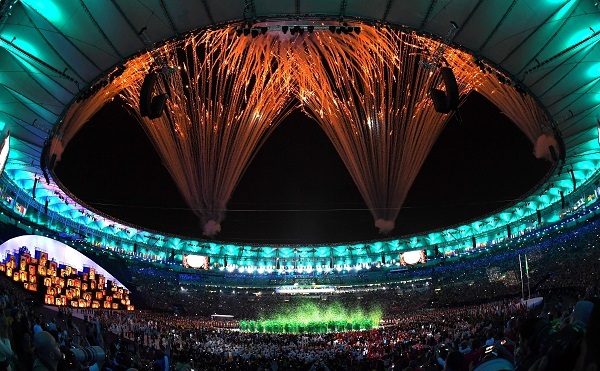 At the opening ceremony on Friday, pounding beat of samba, bossa nova and funk welcomed audiences from across the world. Brazilian stars participated at the ceremony. Supermodel Gisele Bundchen, walked across the stadium to the sound of bossa nova hit “Girl from Ipanema” performed by Daniel Jobim, the grandson of the song’s composer Tom Jobim, whose image was projected on the stage. As the teams entered the stadium, the audience broke into applause. The first Refugee team in Olympic history, Russia’s beleaguered team and a samba-dancing Brazil contingent were welcomed by thundering cheers. 10 refugee athletes fleeing conflict ridden countries have formed the first ever Refugee Olympic Team and will compete under the Olympic flag. Brazil, home to the world’s largest rainforest, the Amazon, also had Rio performers convey a “green message”. Participating athletes were handed a seed of the country’s native trees after they paraded into the stadium. The 11,000 seeds will be planted in the Radical Park in Deodoro to become a legacy from the Games.